I’ll start with the other things. Firstly, I’ve been messing around with the blog a bit, nipping and tucking. The biggest changes are: (1) I’ve added a contact form for people to reach me from the “About” page, and (2) I’ve added a page called “Useful Global Health Research Links”. The latter is mostly for my own convenience, but you might find something useful (and free!) in there too. Secondly, I’m heading into the field tomorrow (looks like the weather will hold). I don’t have my new form of transportation yet, so I’m only going to stay out there for a week and do my interviews in Integrationville (which is easy to access without a vehicle). I might catch a ride out to Isolationville for a day if I’m lucky. My friends (and friends of friends) in Asuncion are looking around at dirt bikes and quads for me, so I’m hopeful they’ll have something nice picked out for me when I get back. I don’t know what I would do without my Paraguayan friends who take such great care of me. I’m seriously spoiled. Thirdly, I figured out the magical “Open Sesame” word which also causes strangers to spoil me. Other people who have traveled in developing countries will know that it can be really hard to get small change. ATMs spit out bills in their largest denominations, and then you have to try and find a store that can give you change from these large bills. Small change is hard to hold onto, so stores are usually pretty tightfisted with their small bills, and banks too at times. In the Chaco, there’s no way I’m going to get change for a 100.000G bill outside of the cities, and it would be totally irresponsible to pay field assistants or participants with a denomination that large. So I need to at least get 20.000G bills or smaller before I leave the city. The banks close pretty early, and there aren’t any banks within reasonable walking distance of the lab, so one time I had to visit the big supermarket and beg for change. I made sure to visit close to closing time so they had big wads of small change they could afford to exchange. They were pretty reluctant to hear my pleas until I uttered the magic word: “I’m going to the Chaco.” “You poor thing! How much do you need?” A very useful word. 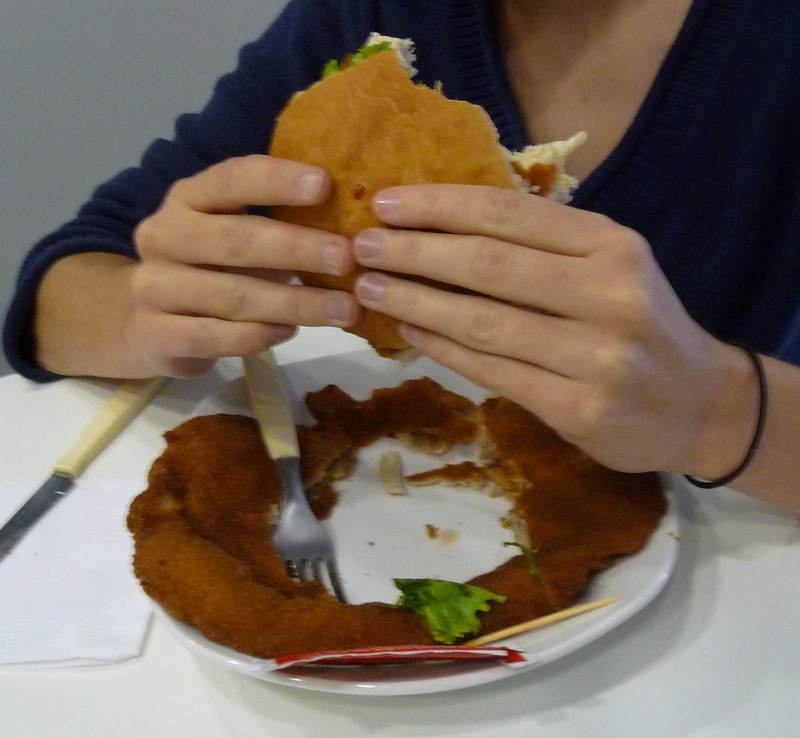 I cut the burger I wanted out of the middle, so I could eat that first. 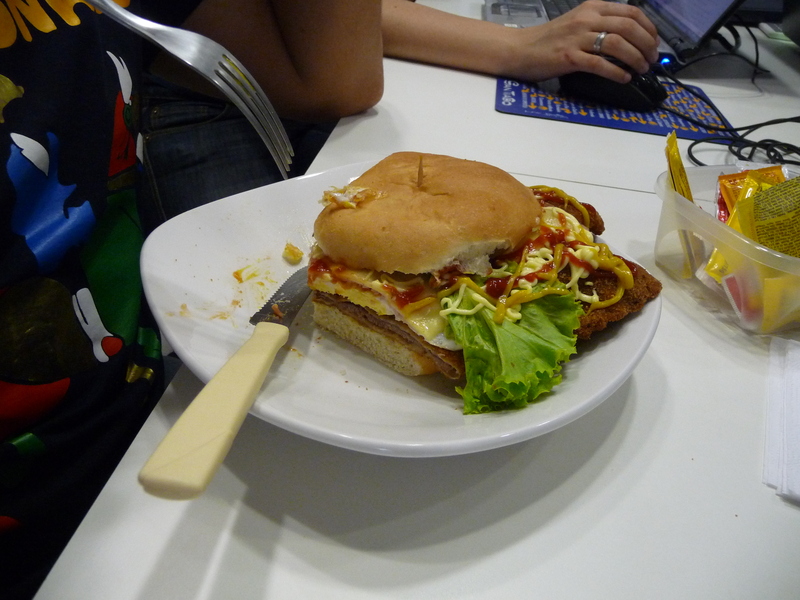 And then I dealt with the rest as if it was just plain old fork & knife milanesa. I like my way better; I think it soothed my cognitive dissonance. I’ve set the blog to automatically publish a post while I’m out of contact this week. So if you see something online prior to next Friday, don’t get too excited, I’m not really online, the internet is lying to you. Woooow…that thing is intense! I think I would of went for the empanadas! Ah, but experience has taught me that the empanadas have a 50:50 chance of making me sick. 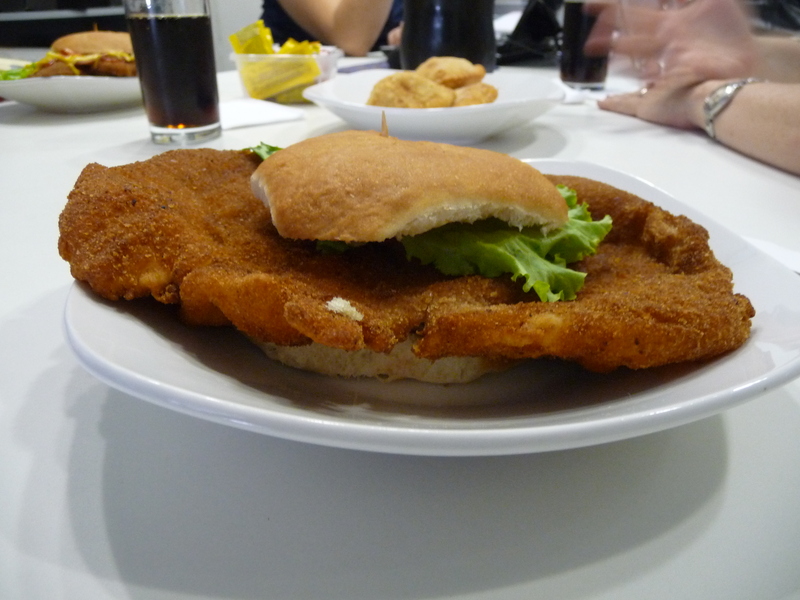 Milanesa hasn’t failed me yet!